Two views of Appuldurcombe House, a grand ‘stately home’ on the Isle of Wight, among its surrounding trees. The house itself has not been occupied since the Second World War. It was originally built for the Worsley family, who were major landowners on the Island and had estates elsewhere in England. At its height it was supposed to have had 52 bedrooms and 365 windows. It fell into decay in the late nineteenth century, and in the first decades of the twentieth century housed a school for a while. During the Second World War, a landmine dropped from a German aircraft blew its roofs off and most of its windows were destroyed. In recent years, the main hall has been reroofed, and that is now used to host weddings and other private events during the summer. If you have a spare £5 million, you might like to consider buying it, with its accompanying farm and land, as it is currently for sale. Originally surrounded by a ‘deer park’, it still has a wonderful collection of trees, many of them very old indeed. Although unoccupied and unheated, parts of the building appear quite warm, largely as a result of solar warming. The trees are also seen to be warm relative to the close-cut grass below their canopies, and the cold sky above. The large tree standing right in front of the house is an evergreen pine, although others around are deciduous, particularly oaks. The cool horizontal structure running to the right of the foot of the prominent pine is a circular pond. 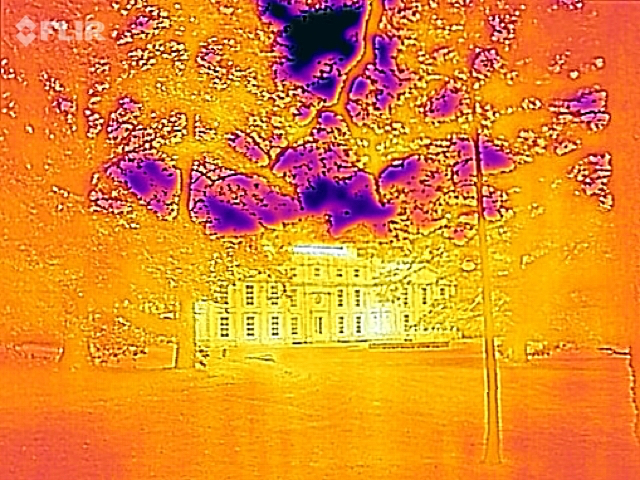 Image captured using a FLIR One™ IR camera and iPhone 6. Standard ‘Iron’ palette, without further image processing. Posted in General, Life, Macs, Painting, Technology and tagged Appuldurcombe, infrared, IR, mansion, trees. Bookmark the permalink.